The Asia Pacific Economic Cooperation Leaders’ Summit or APEC, if you’re feeling a little lost amid the proliferation of global get-togethers is the one where all the leaders line up afterward in colourful shirts, looking – as some commentators have quipped – out of place. Usually that’s APEC’s key takeaway – how out of place everyone is in the Pacific. The summit’s timing could certainly not be more interesting for struggling APEC nations keen to make the most out of the emergence of a sudden race for influence. In just the last week, the Pacific’s simmering struggle for aid, loans and what is being termed “debt diplomacy” has suddenly gone on the boil. 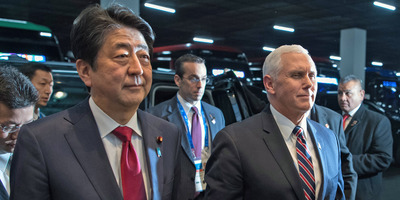 Carl Court/Getty ImagesJapanese Prime Minister Shinzo Abe (left) and US Vice President Mike Pence (right). Over the weekend, as Vice President Mike Pence makes his circuitous way to Moresby (via Cairns) he is reported to be carrying the prototype of America’s Indo-Pacific strategy, rumoured to be based on $US60 billion in regional assistance. Kyodo News of Japan reports the $US60 billion announcement is a bid to diminish China’s rising influence through the extension of its One Belt One Road development strategy. The final piece of the Pacific puzzle, Japanese Prime Minister Shinzo Abe will this Saturday, fly into Port Moresby’s Chinese-built Jackson airport to share his two yen at the APEC summit. Likewise, Abe will be visiting friends and striving to bind new allegiances to counter China’s successes in the Pacific, from the South China Seas to Fiji. So, with new acquaintances to make and money for sale, Port Moresby’s flourishing corruption and eye level impoverishment will be the more than appropriate backdrop for the 21 world leaders’ awkwardly iconic fashion shoots that traditionally close out the summit. The US President Donald Trump isn’t attending at all. During his historic stay, Xi will attend the APEC Economic Leaders’ Meeting from November 17 to 18 and he will also meet the eight leaders of the Pacific Island countries that have diplomatic ties with China. “China has no intention to touch the cheese of any country, instead China is committed to make the pie of cooperation larger,” Chinese vice minister of foreign affairs Zheng Zeguang said on Tuesday. “No country should try to obstruct the friendship and cooperation,” Zheng said when asked about the expansion of Australian aid in the Pacific. To the chagrin of most observers and a small contingent of striking workers, PNG Prime Minister Peter O’Neill has gone on a bit of a wild spending spree ahead of the summit. Despite more than one-third (37%) of his country according to the UN Development Program living way down below the poverty line, O’Neill decided to welcome leaders with several Bentleys and the extra 40 luxury Maseratis specifically flown in for the meetings. PNG, which is the one nation (aside from the wayward Australian state of Victoria) signed up to China’s One Belt One Road initiative, has been a key beneficiary of Chinese investment and many of it’s infrastructure projects will be in display in Port Moresby. Beijing has fixed bits of the airport, had a crack at some transport infrastructure without enormous progress, donated a squad of fire trucks, somewhere near 50 coaches and 35 mini-buses to shuttle officials to and from the a $US35 million convention center built with Chinese money by Chinese companies and workers. Dr. Graeme Smith, a research fellow at the Australian National University’s Coral Bell School of Asia Pacific Affairs told Business Insider that it is likely China has invested somewhere around double the $US3 billion it is rumoured to have staked in PNG. To keep its hands clean in a time of added scrutiny, neighbouring Australia, PNG’s biggest aid-donor and former colonial power broker, is not providing any direct financial assistance for the APEC summit, but is flexing its security muscle and military ties, providing assistance to the tune of $US130 million of APEC’s total costs. Some 4,000 members of the PNG disciplinary forces and their international counterparts will be patrolling the city for the summit, including 1,500 Australian Defence Force (ADF) personnel supporting PNG’s Joint Security Task Force, with just under 500 of those on the ground in Port Moresby. So who’s there this year? Most of the 21 APEC members are from this pacific region with the addition of Russia, United States, Canada, Mexico, Chile and Peru, together accounting for 2.7 billion people – more than a third of the world’s population. Headlining in 2018 is undoubtedly China’s Xi Jinping. Japan’s Abe, Canada’s Justin Trudeau, South Korea’s Moon Jae-in and New Zealand’s Jacinda Ardern will also be there alongside the new Australian leader Scott Morrison. While Pence is standing-in for Trump, so too will Vladimir Putin’s proxy, Prime Minister Dmitry Medvedev, fly the Russian flag. PNG’s Prime Minister Peter O’Neill says he expects $US85 million will be spent by leaders during the time of APEC alone and that playing host will put PNG on the map. O’Neill, whose first move as prime minister was to scrap the anti-corruption body Taskforce Sweep that ushered him into power and then began looking into his own affairs, has allocated around $US350 million for the event. Responding to some of the considerable flak that has come his way, O’Neill says PNG is in fact hosting the cheapest APEC meeting compared to other countries. O’Neill said PNG is on the cusp of hosting one of the cheapest APEC Leaders meetings in history. That seems unlikely considering the summit’s APEC house centrepiece is thought to have cost $US75 million alone. “Excessive borrowing in the boom years has now come back to haunt the government following a collapse in revenue,” wrote in the ANU’s East Asia Forum. What has really caught the public’s attention is the return of polio, previously eliminated from PNG about 20 years ago. “That the other members of this club are the Democratic Republic of Congo, Niger, Nigeria and Somalia – all four wrought by violence – shows the extent of the health crisis that PNG is facing,” Howes said. So what does Howes expect will come of PNG’s APEC? “These may come from China or resource projects. Perhaps PNG will get more aid, but any resource project agreements will be ones that were already in the pipeline. Howes says that it is widely accepted (including by the government) that PNG needs to get a better deal from its resource projects. Rushing agreements so that they can be announced at APEC only weakens PNG’s negotiating hand.